Prospect is a lovely winding road through hills and trees alongside a pictuesque creek running through the farms of western Lancaster County by the Susquehanna River. The wonderful old farmhouses and homesteads along Prospect appear to have always been there. Coming home from my vacation to Virginia last week, I noticed an auction sign dated for today, Saturday, March 16th, advertising antiques. This Lancaster county barn auction was a primitive antique lover’s dream. Large amounts of yellow ware, crockery, stoneware, cast iron, primitive kitchen items, farm tools, furniture, old quilts and everything else, including a very old tractor. The first words listed were “Yellow Ware,” but it was the last words, “Blown Bottles,” in the auction description that got my attention. In an area not far from Manheim, Pa, I was secretly dreaming of a Stiegel daisy and diamond flask or two in a barn with every yellow ware collector from miles around waiting anxiously to bid on bowls, pitchers and food molds and other stoneware while casually ignoring any vessel made of glass. My little dream was not too far from reality, but I did have to lower my expectations somewhat, as there were no extremely rare Stiegel flasks. However, there were some great demijohns in beautiful colors. 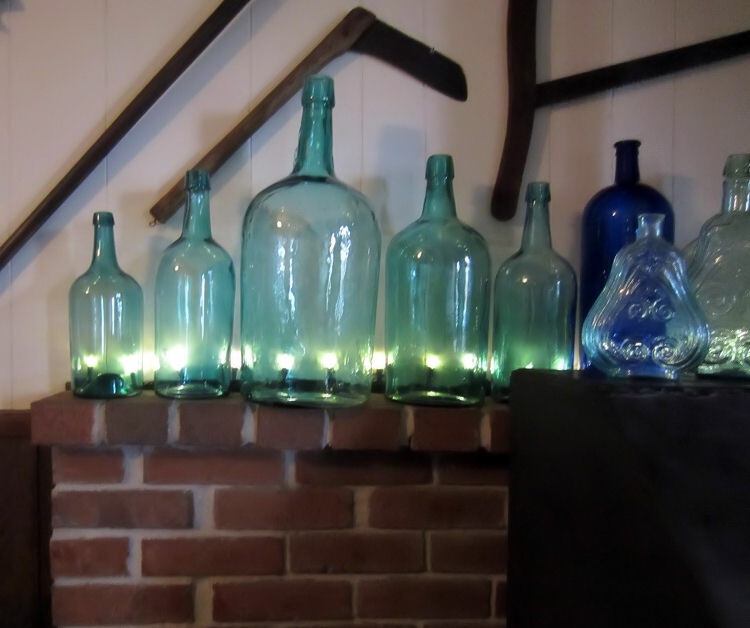 There were a few other bottles with them, and the entire grouping was sold in two lots. The Yellow Ware went as fast and furious as the auctioneer’s rapid fire ramble. When the bottles came up, what surprised me, (or, actually didn’t,) was it being only between one other gentleman and myself. Despite the ice cold rain and dreary weather, there were easily 100 people at that auction and the two of us were the only bidders on the demijohns. I won the demijohns. It was really just the largest and oldest one I wanted, but the others were very pretty and the price was right for all of them. They had sat in that barn almost forever, as they were covered with aged dirt, dust, and overall grime. Having looked at them closely during the preview; I knew they were gems in the rough. I saw no condition issues of any kind, these just needed an easy rinse. Old barn grime proves no match to a bit of windex and some cleaning ingenuity. Rinsed and dried. A very nice grouping, considering just having been acquired today. 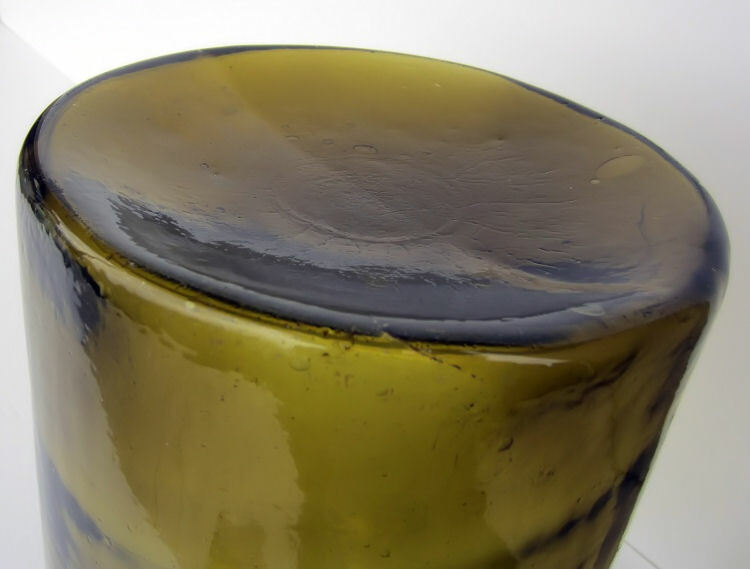 These demis are good sizes; 12-1/2″ high to 18″ high. Note the colors, the 1880’s golden amber on the left, the earlier light apple green, then another almost identical 1880’s turquoise to an example I already have. On the right is the 1860’s largest, oldest, olive honey yellow one. In my opinion, I made off with the best piece of “yellow ware” there. 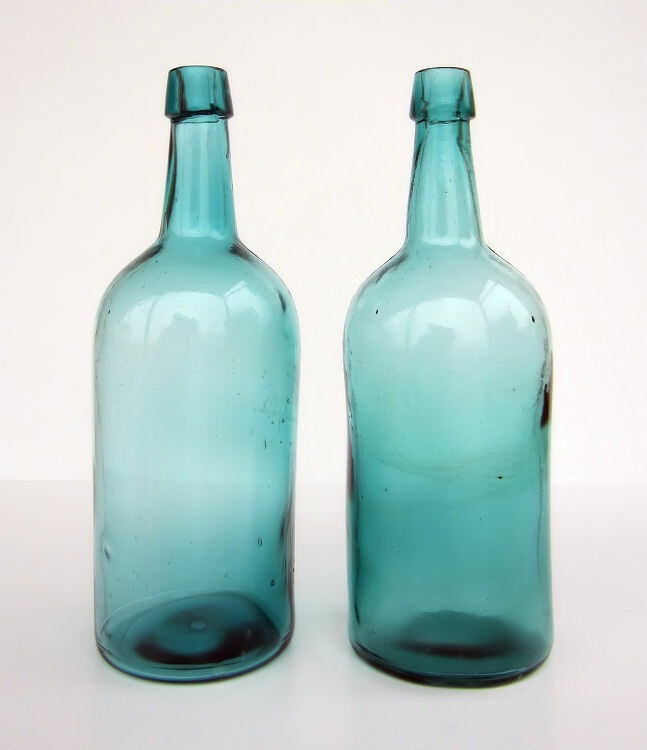 Seen below, just for a side by side comparison, I put the two 1880’s turquoise half gallon demijohns together. They are virtually identical in size, make and color. I am told this color is a “Philadelphia soda water bottle” type of blue. If so, I suspect Union Glass Works. The one I acquired today is on the right; note the green swirls running through it’s middle. 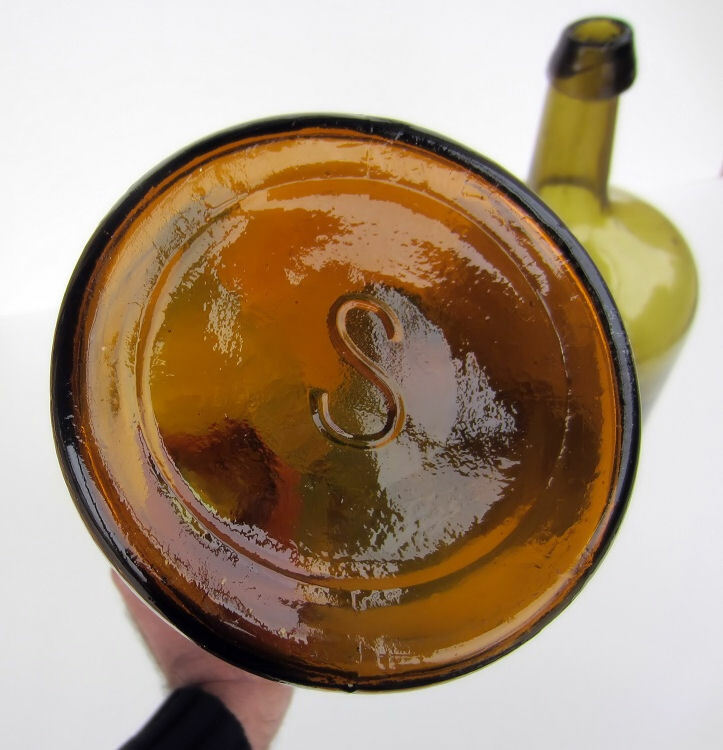 The amber half gallon demijohn features a large embossed ‘S’ on it’s base. 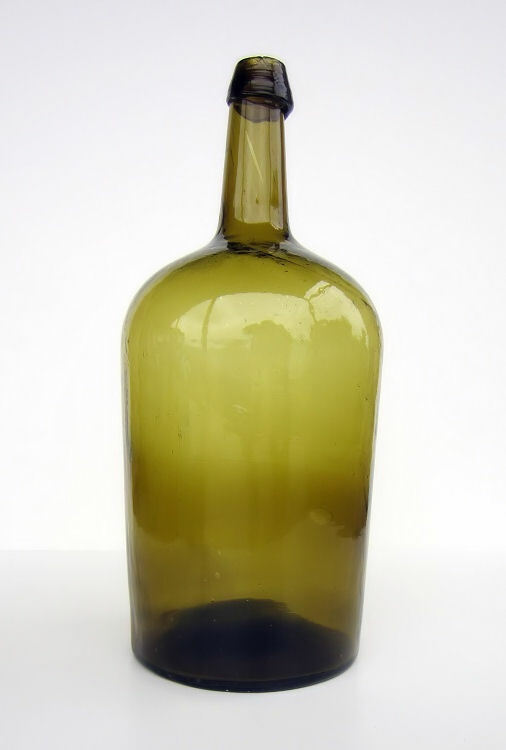 Recently I saw a green example, owned by a friendly demijohn collector, that was identified as being from Lyndeboro, New Hampshire. The 18″ high by 7″ across multi-toned olive honey yellow is the oldest and the one I was really after. 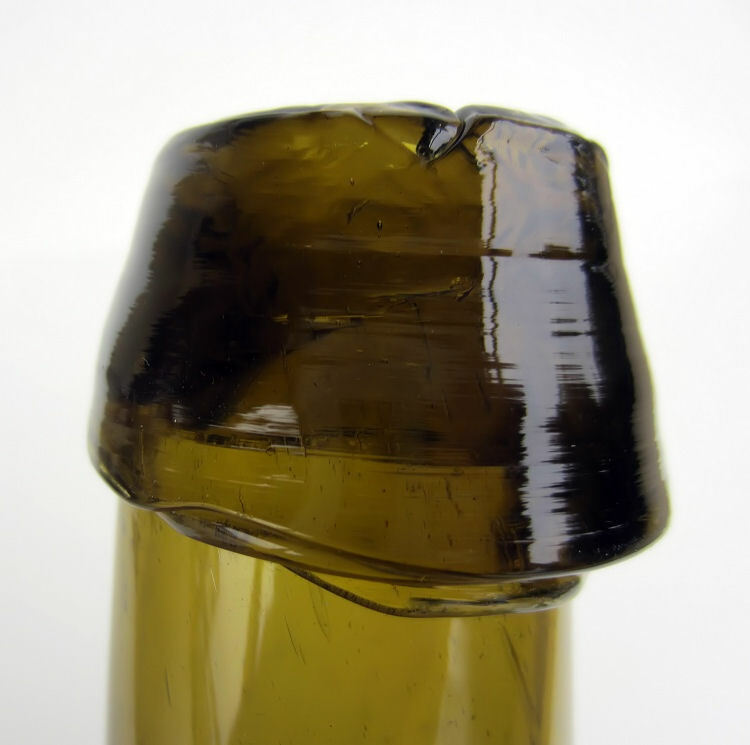 The crown of the piece is the exceptionally primitive glop of a top. The top is so primitive and beautiful. 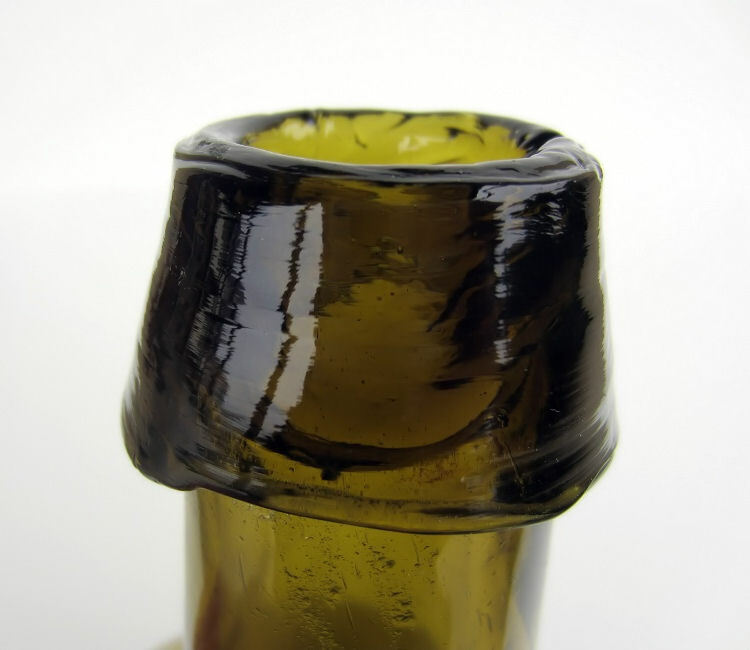 The base is smooth, but very crude also. 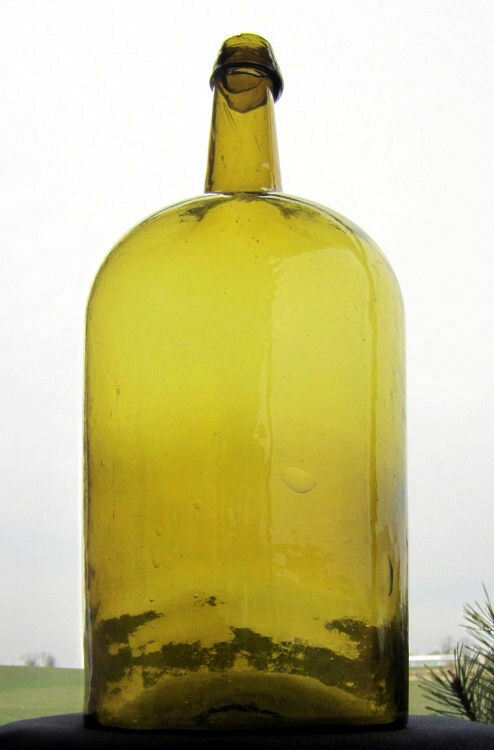 The large demijohn shown above is not a heavy one, the glass is surprisingly thin and very bubbled and whittled. 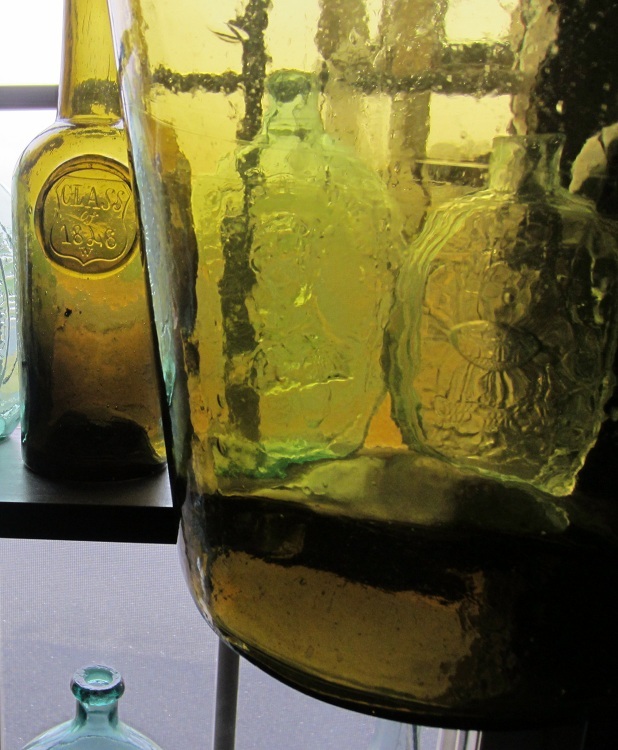 I noticed it is the identical color and tone of a very special Dyottville Glass Works, Class of 1846 W bottle currently under research. See below for comparison. 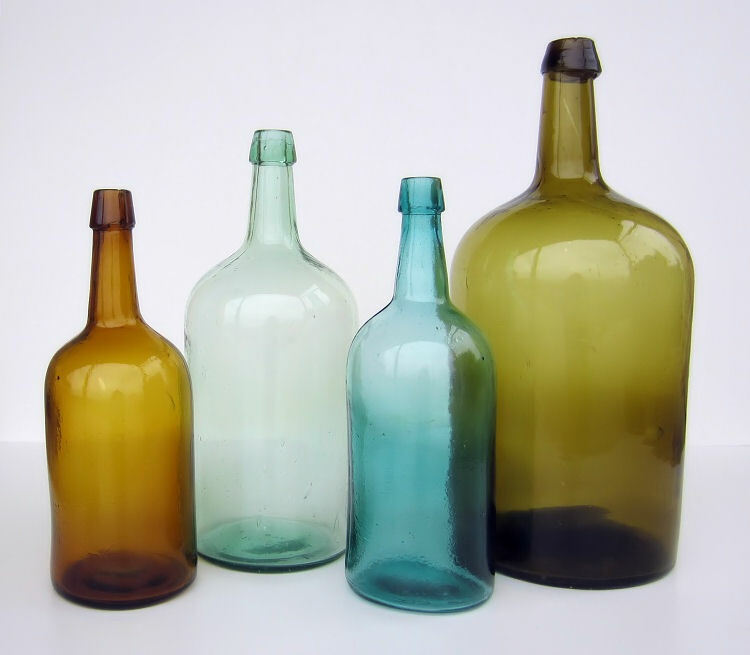 The large demijohn is likely 15-20 years newer than the 1846 bottle, but having come from less than an hour from Philadelphia, could this demijohn have been produced by Dyottville Glass Works? 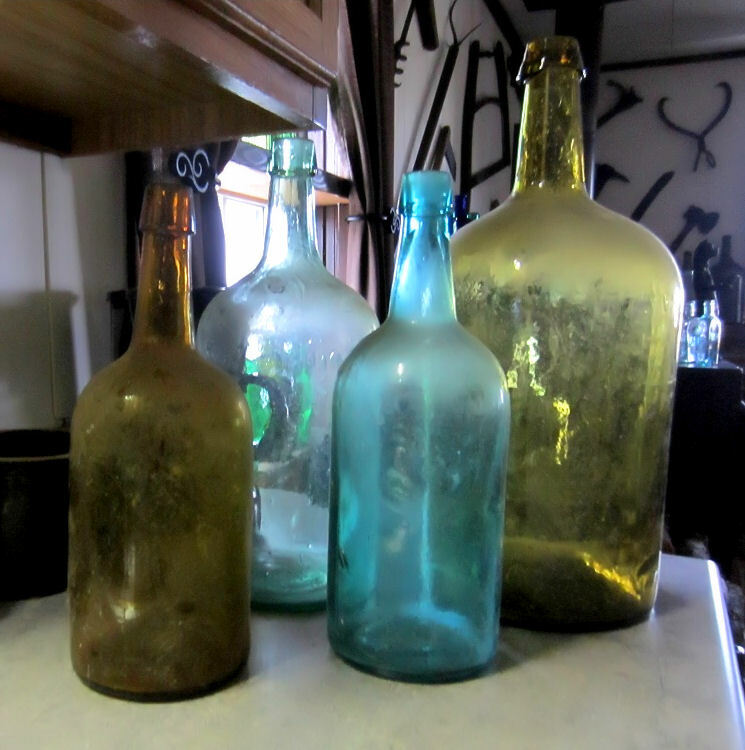 Now where to find a place for these beauties in a home where space for more antique bottles is becoming a real issue. My woodstove ledge could use a little reorganization. This side reminds me of earthy, seasonal colors. The Lyndeboro one is on the right and the large olive honey is in the center corner. 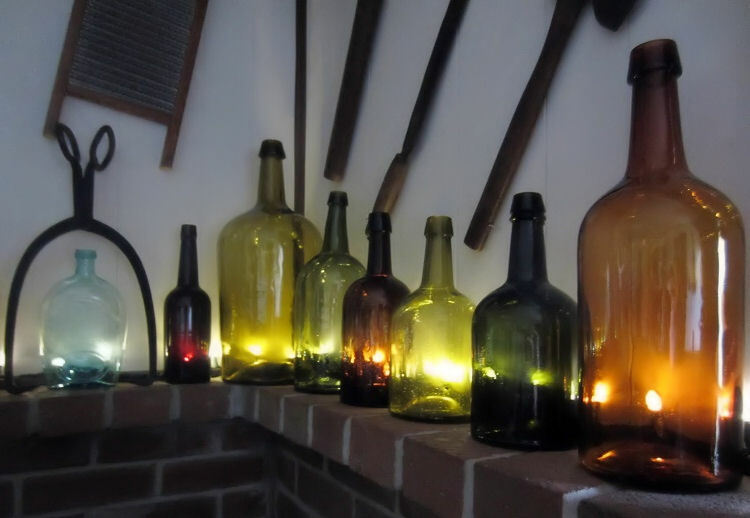 Nothing shows color like primitive old glass. The turquiose and light teal demijohns have a look all their own. All were found locally and the smallest 10″ one on the left is a freeblown Pittsburgh example. 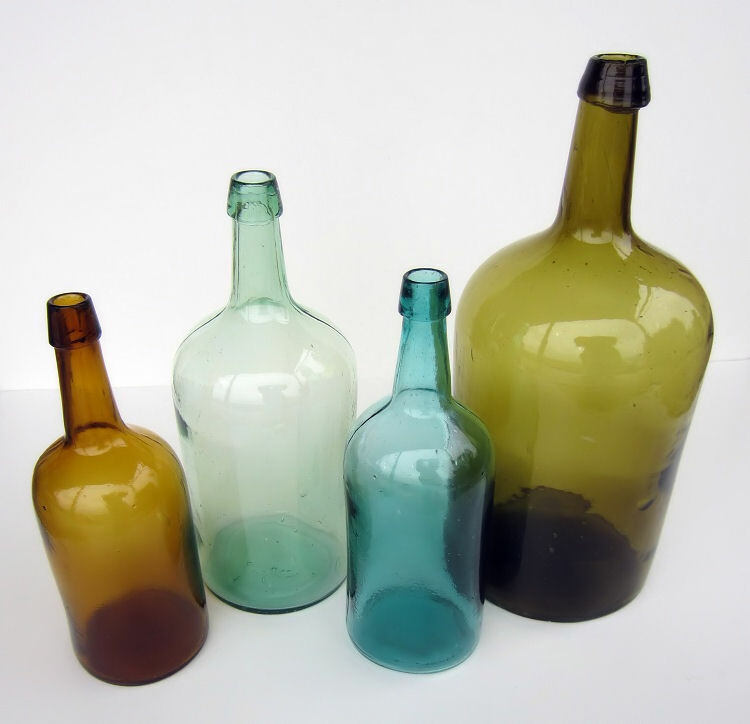 The very tall, tubular, cobalt blue is an English poison or essence bottle. 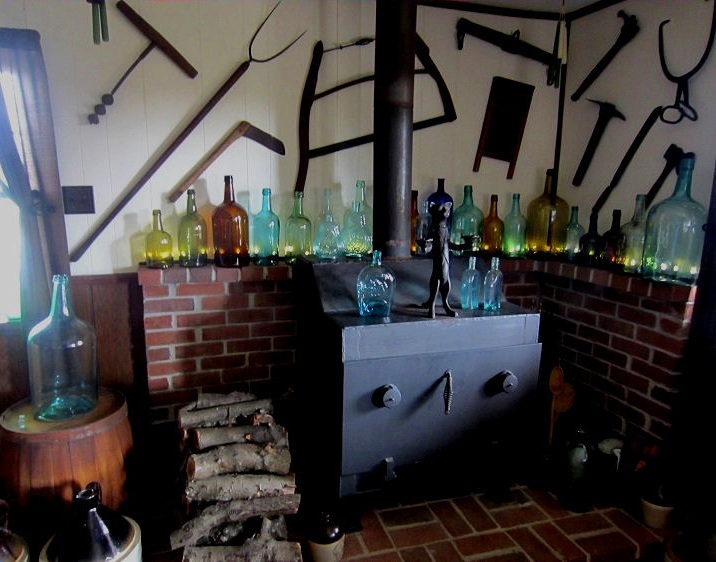 Note the ‘flak,’ or ‘extraction’ on the left side of the neck on the largest, crooked demijohn in the center. Now it’s time to spread the color around. Much better, but there’s a lot of glass to be moved if I want a fire in the wood stove. A very good day for Demijohns. And the rain didn’t bother me a bit.